Public Space is awash with noise and sound. Since 1998 the "Favourite Sounds" project has aimed to discover and celebrate what people value about the soundscapes of the cities and neighbourhoods where they live by asking the seemingly simple question, ‘What is your favourite sound of London, Beijing, or Berlin, or…, and why?’ The replies reveal the cities of the ear and the important role that everyday sound plays in our lives. The talk will outline some of the findings and their implications for the way we consider the acoustic environment. 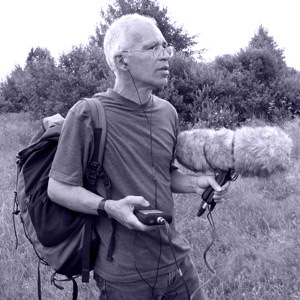 Peter Cusack, musician, field recordist, sonic journalist and lecturer at London College of Communication. Initiator of the "Favourite Sounds" Projects (since 1998) which explore favourite sounds in big cities on the basis of surveys and evaluate them artistically. Also: ”Sounds From Dangerous Places“, a research based on recordings of acoustic environments in ecologically problematic areas. In 2011: guest of the DAAD Visiting Artist Programme, Berlin. Lives and works in London and Berlin.